I'm Twin Peaks-challenged — always loved the pie, but please don't ask me why the Arm now looks like the tree from A Charlie Brown Christmas — so after the Showtime premiere of Twin Peaks: The Return, I sought professorial help. Daniel A. Robinson is the Homer C. Nearing Jr. Distinguished Professor of English at Widener University, and his scholarly focus is on British literature of the late 18th and early 19th centuries, the Romantic era. He's also a serious Twin Peaks fan and has occasionally taught a course on the show, most recently last semester. Daniel A. Robinson is a professor of English at Widener University, who this past spring taught a course in "Twin Peaks and the Media of David Lynch"
So, what did you think? Did the new show live up to your expectations? It lived up to my expectations in the sense that I realized it was not going to be just the next episode, picking up from Season Two. I've come to understand that Twin Peaks, and all of its related media, they're each their own thing. There's the ABC series, there's the film Fire Walk With Me, now there's this Showtime series; there are the books, the sound track. Every iteration of Twin Peaks is its own unique variation. It's not like Star Wars. They're not all chapters of the same book. Is there a connection between Twin Peaks and Romanticism? There's a very concrete one. A poem ["Love's Philosophy"] by Shelley plays an important role in the second half of the second season. Twin Peaks' interest in dreams and dream states, that's very Romantic. And the way that David Lynch himself associates dreams and the subconscious with creativity, that's classic Romanticism. What made you decide to teach a course about Twin Peaks? I actually got the idea from a good friend who introduced me to Twin Peaks. I didn't watch it when it first aired. I was in college at the time, and I didn't have a TV. And so my friend Dan Albergotti, who's now a pretty successful poet, we were in graduate school together, and he would just come over and show me episodes. And he had taught a course on it. When I got my job at Widener, the director of the honors program asked me if I would teach some kind of unique honors course, and I stole Dan's idea. You first taught the course in 1999. Now, most of your students wouldn't even have been born when the show premiered. Has the course changed? Oh, yes, very much so. When I first created the course, it was called "Twin Peaks and Postmodern Television." The X-Files was still on, and The X-Files was kind of a poor man's Twin Peaks. So the students back then were more aware of The X-Files than they were of Twin Peaks. It was sort of the beginning of that golden age of television. The Sopranos was on. Buffy the Vampire Slayer was on. I think I've taught the course maybe five or six times, and I started to feel like I was going to get tired of this thing that I like, because watching two hours of the same show every week, over and over again, you get so you need some time away from it. But you came back to it this year? I thought, since the show is coming back, I'll do it one last time. Turns out this was the best semester yet. But I changed it to "Twin Peaks and the Media of David Lynch" [and taught it as a humanities course]. I wanted to look at his art and the other films. Because [the students] had no context for television anymore. So much of the original Twin Peaks was a parody of soap opera. You kind of had to remember Dallas. But it ended up being mostly a course on Twin Peaks. We read The Secret Diary of Laura Palmer [by the co-creator's daughter, Jennifer Lynch], The Autobiography of F.B.I. Special Agent Dale Cooper: My Life, My Tapes. [by co-creator Mark Frost's brother, Scott Frost]. We read some scholarly articles. Couldn't David Lynch's reference have been something much older than Dallas, like Peyton Place? Yeah, exactly. But don't forget — and this is something that's driving me crazy about the publicity push for Twin Peaks — is that Twin Peaks is very much a collaboration with Mark Frost. He started out in television. He was a writer for Hill Street Blues. Everybody attributes it to David Lynch, but there's so many other important people involved in the creation of the original Twin Peaks. Lynch has said he stopped watching the second season. I think he's being a bit disingenuous, because he actually appeared in some of those maligned episodes, as Gordon Cole. I love the second season. I'm not saying there aren't terrible goofy things in the second season, but every episode has some nugget that is better than you'll get anywhere else, even if the rest of the episode is terrible. The thing about Twin Peaks, and I think it's probably true of the new season, is that it isn't very good television. But it's brilliant narrative art. Because it doesn't want to do what television does. It wants to do what literature does. Most television shows don't want to require that you watch 10 times before you really appreciate it. There's a difference between making you intrigued enough to watch the next episode and actually requiring that you wait until the whole thing is done and then go through it all over again. That's the way you have to view Twin Peaks. You have to go in a circle, and I don't know how the new season is going to work, but it actually was a beautiful circle the way they had it before, where you saw the pilot, you go through the Laura Palmer thing, you go through the Cooper arc, you end the series with Cooper being possessed by Bob. And then you go to Fire Walk With Me, which is mostly a prequel but is in some ways a sequel, and Fire Walk With Me ends with the murder of Laura Palmer. And then you go through it all over again. And every time you go through, you see that there are more and more rings as you go around the circle. Where do you think this new season might fit in? There was the major arc of the original series that was the murder mystery. And then during the low point of the second season, the arc became Cooper's story, a tragedy. But it seems to me that this version of Twin Peaks is epic, and he's the epic hero. He's Odysseus on his way home. It's supposed to be not the Twin Peaks that we want. I think we're going to get gradually closer to that. In literature, that's called nostos, the return home. 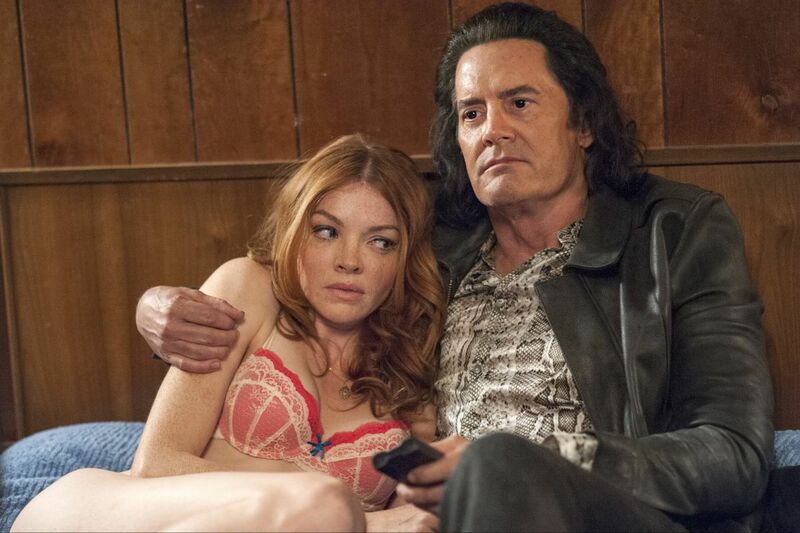 What everybody wants is to go back to Twin Peaks and to see Agent Cooper drinking coffee and eating doughnuts. Everybody wants that Twin Peaks. I think they're going to give it to us, but they're going to make us follow this journey.